Congratulations to Suzanne Fajardo for winning the GC. Thanks to everyone who participated! More giveaways coming up! Admit it. You like taking photos of your food. Don’t worry, I’m not judging. Heck, you know I like taking food photos, too. While some restaurants frown at the practice, one doesn’t only encourage it, but actually created an app just for it! Presenting Yabu’s Katsu Craze app from Yabu: House of Katsu. Available in for iPads, iPods and iPhones, this app works much like Instagram and other photo apps. You take a photo or pull one up from your gadget’s photo library, then add filters, thought balloons and text. Afterwards, you can share the resulting photo to your social networks or even the Yabu.ph photo gallery. Why will you want to share it to the Yabu photo gallery? Well, aside from the reason that you’re addicted to Yabu (I confess, I am), it will actually give you a chance to win an iPhone 5 (I confess again, I want one). So, why not right? 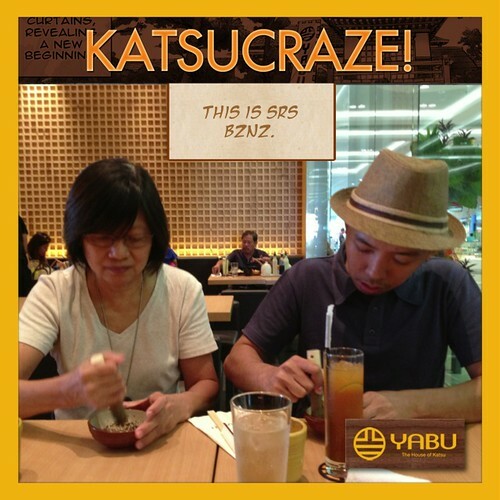 Download Yabu Katsu Craze now from the appstore for free and start capturing those Yabu moments. Still not convinced? Well, will free lunch (or dinner) do the trick? Win a 1k GC from Yabu! Just check out the widget below to find out how you can win. Information and gift certificates were provided by Yabu but opinions are author’s own. I love their salmon katsu, and the dropping of the sauce cover every single visit. The service at the Megamall branch is great — matches the food. I always try something new each time, but I often get the rosu katsu. I’m glad that they have a branch at Southmall now. I don’t have to go far! I always get flooded with Yabu pictures (IG/Twitter) and the app is a great way to make it more fun! Whatever you order in Yabu, it will always look photogenic! call me a loser but i haven’t tried Yabu yet! there’s no branch near me and i heard the queue is really long. been hearing about their famous katsu sets, and if i’d get the gcs, i’d rush to yabu to try it no matter how far it is! 😀 i wanna try the seafood katsu sets too. I still cannot forget my 1st visit at YABU. I tried their kurobuta & was so shock how tender the meat it was!! I more of a chicken katsu person than tonkatsu, but kurobuta katsu is a must when I go to YABU!! I only eat one thing here and it's their veggie katsu set as I am not very fond of eating meats. Despite them being a katsu-centric and pork-focused establishment who is committed to excellent delivery, they want to make sure they capture every single heart out there–even ones who do not care as much for kurobuta or hire or rosu or crab. That's what makes an excellent restaurant in my book. This is funny but i look forward to the shredded cabbage+ sauce(s) the most when eating at Yabu 😀 I also love the fresh fruit with pink himalayan salt! I love their Rosu Katsu Curry! And the unlimited rice, cabbages, and miso soup! I’m really glad they added the unlimited miso. It was the first thing I requested they add in their service and menu after my first time in Yabu. Frankly I think that’s ablteuosly good stuff.